You love the idea of starting, running, and building a business (or else you wouldn’t be reading this). It’s something that’s an extension of yourself, fulfills your passion, and provides you with the best life you could ever live. But the keyword is that you “love the idea”. Very few people actually know how to start, run, and build a business. That’s why JuniorBiz was born. More specifically, that’s why we spent $80,000 on our education, dedicated hundreds of hours studying the world’s top young entrepreneurs, and combined this knowledge into one of the web’s most comprehensive, practical guides on how to start a business. Have an Idea – Small, big, or kooky. Know the Ropes – Check out your market and competition. Plan your Success – Discover how you’ll make money. Legal Mumbo Jumbo – Everything from licenses to LLCs. Market your Business – Hone in on your target market. Reach your Customers – Let people know you exist. Lift Off – Transform your plans into actions. Get it Done – Master the day-to-day. Find your Fortune – How to collect and manage your money. Grow – Earn a spot in our next book. Yep. Those steps are just the beginning. Nick and I are wrapping those steps into a free gift that you can begin unwrapping right now. 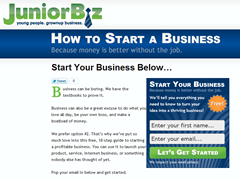 Learn more about ‘How to Start a Business‘. Congratulations! All you have to do is fill out your name and email in the box below. Over the next 10 weeks we’ll take your hand and walk you through starting and building your business. We’ll tell you everything you need to know to turn your idea into a thriving business! P.S. Why are we doing all of this for free? Sign-up and you’ll find out ;).